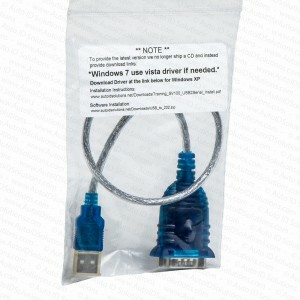 USB to Serial Adapter is necessary for configuring Printronix SV100 and SV200 Bar Code Verifiers which are connected to a computer that does not have a RS-232 serial port. Caution: Not all USB to Serial adapters will function with the Printronix SV100 and SV200 Bar Code Verifiers. In initial testing Auto ID Solutions tested more than 20 different adapters before finding an adapter that was 100% functional without any system crashes or missing data transfers. NOTE: Software driver MUST be installed BEFORE connecting the USB to Serial Adapter to your computer.